Home > Printable Coupons > Fresh Express Salad Coupon on Facebook at Noon! 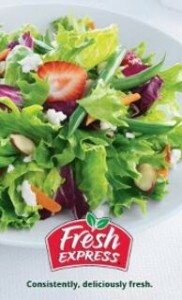 Fresh Express Salad Coupon on Facebook at Noon! If you aren’t a fan of Fresh Express Salads on Facebook, you need to be. On Thursday 11/10, at approximately 12 Noon, ET, they are giving away 5,000 coupons on Facebook, good for $0.55 off Any Bag of Fresh Express Salad. These will definitely go fast so go ahead and click “Like” on the Fresh Express Salads Facebook page and be ready at 12 PM tomorrow to get your coupon!